"I was pretty hammered and approached Steve Harris and said 'You should get Paul Di'Anno back in the band! Killers, man!'." 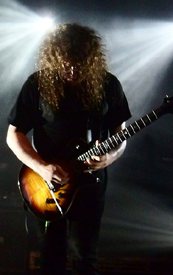 Opeth put out its new live recording Garden Of The Titans - Live At Red Rocks Amphitheatre on November 2nd and Metal Covenant met up with guitar player Fredrik Åkesson in order to listen to his reflections of it. Tobbe: Your new live recording is out on November 2nd and what can you tell me about it? Fredrik: Well, it's from the Sorceress tour. We were offered to play at that place, Red Rocks in Colorado, which is a legendary amphitheater and I think the first concerts there were taking place in 1906 or something like that and there are also traces from dinosaurs up there. An amazing geological find, so to speak. Our manager came up with the idea to record a DVD, because we haven't made a DVD since Royal Albert Hall  and we have recorded 3 studio albums since that one. So we felt that this was a good opportunity and we felt that the band was in great shape and above all it was really cool to be able to record specifically at Red Rocks. The sound becomes something special with all those gigantic rock walls and of course it also looks really grand. And we haven't made an outdoors DVD before as well, so it felt a little fresh and good, you know. Tobbe: So the venue was really a contributing factor for recording the DVD? Fredrik: Yes, a bit, you know; to get some variation. On the last one we did the entire Blackwater Park record  from start to finish and then a mixed set. This was after the Watershed record . So on this setlist we left out songs from Blackwater Park in order to make room for songs that hadn't been on DVDs yet. Some songs, of course, were on the setlist, like Deliverance and Demon Of The Fall and some classic songs. But it was a hard gig. It was extremely cold. In the daytime it was very hot and people were out running. It's like a park up there. But when we started playing the temperature had fallen to 0 degrees Celsius and then it got really stormy, which you are able to see on the DVD. The wind was blowing quite hard and we were like "So typical. This kind of weather.". We were so stoked and you only got one chance, you know. So when we got off the stage, we thought that we had made some errors and had been quite sloppy because of the cold temperatures. But when we listened to it, it wasn't that bad actually. Tobbe: So just some minor changes afterwards? Fredrik: Well, we chose to not cheat too much. I was thinking about re-recording one of the guitar solos, but Micke [Åkerfeldt, vocals] told me "No. It's not gonna happen.". It's kind of cool if there's some stuff that isn't perfect, because there's too much stuff that is too corrected today, and it just adds to the live feeling. Tobbe: It has been one and a half year since that gig and why has it taken so long to get this thing out to the people? Maybe some marketing and not so soon after the Sorceress album ? Fredrik: Well, maybe. It was supposed to be out in September, so it's postponed, and maybe it's because of, I actually don't know, getting the interviews going. It was summertime, people were on vacation, so maybe it was a better option for the record company to release it now. So it's a good question actually. We didn't start watching the mix until quite some time after this gig. I think we were working on the mix during this spring, and then a summer break, and then the artwork took quite some time as well. Micke and Travis Smith, who has done all the artwork for Opeth since the Still Life record , were working a lot on that stuff and it took its time. At the same time it feels good that we've had kind of a break now, in terms of playing live. We did 4 festivals in June and before that we played some shows in England in November last year, so we've been kind of free, you know. It's been a very luxurious long break. Tobbe: What kind of stuff does this DVD feature, besides the actual gig? Bonus material, etc. Fredrik: We've been filming some stuff, but we've been putting that up on YouTube instead of having it on the DVD. We've made 3 short clips that we put out for free. We bought some GoPro cameras, but every time someone forgot to bring them along. But Micke were able to get some good clips together, at specifically Red Rocks, which I checked out. I actually laughed; it was pretty funny. He can be quite funny sometimes. So that's what we've got. But there will be quite a few editions of the vinyl, like limited stuff. Nuclear Blast is kind of keen on putting out a whole lot of different editions. I haven't kept track if there will be some kind of limited box-set with DVD, CD, vinyl, Blu-ray, but they will probably come up with something. Tobbe: Is there still hope that fans aren't satisfied with just a poor-quality YouTube clip and really, really want DVDs and Blu-rays still? Fredrik: I hope so. Somewhere I have a picture of the way it was when I was young myself, like when Maiden released Live After Death or when Judas Priest released a live album. It was magic back then and live albums were really big and important. I don't know if that's the case now, but I have a little hope that it will maybe turn out like that. Therefore we put in a lot of time on the cover art. I just got the vinyl delivered and it turned out great; gate folded and a lot of pictures. 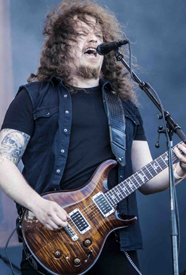 Tobbe: Everyone knows that Opeth has gone through a significant change in style of music over the years and the oldest songs are very different to the new songs and don't you ever think that it might turn out too spread out to have such different songs on a DVD? Fredrik: Well, we're a band that likes to spread it out, really. It's not something we try to cover up. And especially Micke, who is writing most of the stuff, likes to have it spread out. And I think the newer songs sound heavier and more powerful live than what they are on the records. It's more beef and more guitars, you know, and I like that, because I'm a guitar freak. I think the mix of songs is working fine and it gets a great dynamic from heavy to a different kind of heavy. Tobbe: What do you guys kind of gain personally by having the kind of progress that you have? Fredrik: A little bit of everything. A strive to not repeat yourself is important, and to find new challenges. Micke has clearly said that just make a record for business reasons isn't gonna happen. He would rather put the band to rest. There's a strive to do something that feels fresh for the band. But we still think it's great to play old songs live. It's not like we try to distance ourselves from it, but to go back now and make a record that is similar to Blackwater Park for example isn't in question and Micke wouldn't wanna do it because that's selling out. Tobbe: Through this progress, how have you guys been able to bring your fans along for the ride? You know, some people might be pretty narrow-minded from time to time. Fredrik: Well, we don't play less concerts, so if you look at it that way there's still interest in us. We have probably broadened our fanbase a little and maybe there's more fans of progressive music coming to the shows now. But we still see a lot of young metalheads coming down to the gigs too, which is really great. When we released Heritage , maybe we took it a little too far, because on the first tour we chose only old songs without growls. In hindsight, maybe that was a bit extreme, but it was cool that we carried out our plan anyway. We got some complaints there, which I fully understand, so we did rethink that decision after that tour, that we also would like to make the old school fans happy as well. It's a big part of the band's history and sound too. Tobbe: Do you still hear fans telling they're disappointed over your choices? Fredrik: Well, not face to face. And I don't read so many comments on YouTube and stuff. I don't always read the comments on Blabbermouth. Of course there are many that say so, and there always will be. They said that back in the day when it was death metal too. There's always something to complain about, you know. But it's up to them and there's still people coming to the show, you know. And also younger generations, who like the new stuff, I've noticed. It's great to see that. 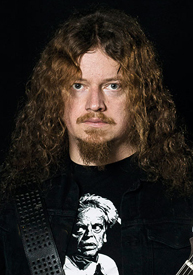 Tobbe: The keyboards and stuff like that in Opeth's music get more room than they did before and how is it possible to give an instrument more room without putting less focus on the other instruments? Fredrik: Well, I like guitars. I want a lot of guitars. [Laughs] But, I guess it's new ways to go to write music and especially for Micke who writes almost everything. Back in the day maybe something would have been played on a super distorted guitar, but now it's maybe played on a mellotron or a distorted organ. It's just a way to widen our sound. But live and so, there's still very guitar based too, and there's still a lot of guitar craftsmanship on the records, you know. Tobbe: As time goes by, what will your setlists look like? Because you've put out a lot of records now and there's a lot to pick from. Fredrik: On the last couple of gigs, in last November, we were super pretentious and rehearsed a couple of songs that were really challenging: Moon Above, Sun Below, that we had never done before, from Pale Communion  for example, which was rather difficult with a lot of choirs for me and Joakim [Svalberg], the keyboardist, to get right when the rhythm goes in a different timing. And we did Hessian Peel from Watershed and a little more difficult songs; just epic, difficult songs. So it was great, to challenge ourselves, so I think we will think about songs that we haven't done in a while the next time we get the machine going. Not just crowd pleasers. 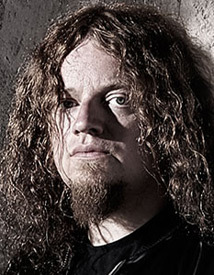 Tobbe: Might Opeth reach a point some day where you guys pretty much will play almost only newer material? Fredrik: Well, I don't know. I think we will always play some of the old stuff as well. It's such a big part of the sound and such a big part of Opeth's history and we still think it's fun to play that. It's always hard for us, since more and more albums are made and the songs are very long. Our goal is to play at least one song from each album, but we can't really do that now, if we want to play some additional ones from the last one. So it's a challenge to create a good setlist. Some songs are a no-brainer, like Deliverance for example. It's the optimal song to end the set with, and it will probably remain that way. It's Opeth's Smoke On The Water. Tobbe: After soon 12 years with the band, do you still hear that you are the new guitarist? Fredrik: "Get Peter back! ", all the time. [Laughs] No, just kidding. It doesn't happen so often, but when I do hear it, I just laugh, and that's just something you have to tolerate, you know. Nothing strange, really. Tobbe: Yes, 12 years soon. I think the music industry is maybe the only place where you is considered a new guy with what you do after so long. Fredrik: For how long were Mickey Dee with Motörhead? Like almost 25 years? And I guess he also heard that once in a while. Tobbe: Bruce Dickinson doesn't often get to hear that he's the new Iron Maiden singer, I guess. I was pretty hammered and approached Steve Harris and said "You should get Paul Di'Anno back in the band! Killers, man!". There's probably a lot of those people; schmucks, like I was. 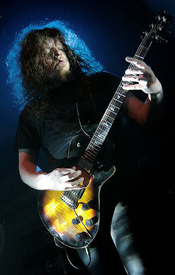 Tobbe: Before you joined Opeth you were doing a lot of stuff in music, but today you're almost only involved with that band and how does it feel to be steady in one band now in comparison to doing different things? Fredrik: It has always been my goal, to focus on one band. I like the whole idea about a band, that everyone contributes. So I was very happy when I was asked to join Opeth. I knew about them a little bit before and we have toured with them for some time when I was in Arch Enemy. But it's true, I have played different genres within hard rock and heavy metal. The first gig was Talisman; pretty melodic, rather technical, a lot of solos and stuff. Then it was Tiamat; early Tiamat with kind of doom/death and then later on more like Sisters Of Mercy maybe. Not my bag perhaps, the later stuff. And then Krux; epic doom metal. Well, etc. So I have been in some different bands, which probably have been a useful experience before I joined Opeth. I always try to develop as well. I'm not only listening to heavy metal, but some jazz theory stuff that I can embrace in what we do, you know. But I've done a couple of things now; I laid down a solo on Ihsahn's, from Emperor, new record [Àmr] and then I have written some songs with Biff Byford actually, to his coming solo album. So we're mailing ideas back and forth. It's pretty fun actually, to get to ventilate a classic metal feeling. We'll see what happens, but it's great, and especially the other day when I heard the vocals added to a song idea that I made. I couldn't see that coming when I was 16, you know.